Lip sync fails are not uncommon these days. But November 19, 1990 saw the culminating moment of one of the most shameful not-actually-singing debacles in pop music history: it was the day Milli Vanilli was stripped of their Grammy. Milli Vanilli started as the brainchild of German producer and songwriter Frank Farian. In early 1988, Farian recorded a group album with a slew of vocalists, but, finding them unmarketable, recruited dancer/models Robert Pilatus and Fabrice Morvan to front the group when the album was released in the summer of that year. Note that singing is not, at this point, on their resume. If the European record didn't necessarily state that the handsome frontmen were the ones actually singing the songs, by the time the American album, reworked extensively by Arista Records, was released in early 1989, all trace of the original vocalists had vanished. After a string of three number 1 hits and a Grammy for Best New Artist, Pilatus and Morvan had essentially become the entirety of "Milli Vanilli." But things started to unravel at a live MTV performance later that year. During "Girl You Know It's True," one of the group's hit songs, the backing track skipped, repeating the phrase "girl you know it's true" over and over and over again. They weren't really singing! No one at the concert seemed to really notice or if they did they didn't really care, but the media started to scrutinize the group's recordings, and on November 12, Farian conceded that Morvan and Pilatus did not sing Milli Vanilli's songs. 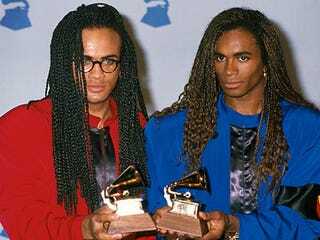 Four days later, on November 19, Milli Vanilli was stripped of their Grammy. That wasn't the end of Milli Vanilli—they recorded a second album as "the Real Milli Vanilli"—and it certainly wasn't the end of lip synching—hello, Ashley Simpson!—but it certainly remains one of the most high-profile song and dance fake-outs in music history. And you have to wonder: If not for that faulty backing track, that one technological hiccup in a vast system of amps and lights and microphones and music, would we even know the truth about Milli Vanilli today?